Buckle up—here comes your childhood throwback of the day. Do you guys remember the part in 101 Dalmatians when Pongo notices that all the dog walkers look like their dogs? Well, Dave and I may not really look alike (if only my torso were that long! ), but we do share bizarrely sensitive skin. Yep, spontaneous rashes, itching, and bumps. All of it. 1) Eco Mutt Dog Soap: This soap is handmade in Ireland and scented with lavender, tea tree oil, and citronella. 2) L:A Bruket Dog Shampoo: Crafted in Sweden, this shampoo is scented with tea tree oil, mint, and lime. 4) Bobbi Panter Natural Moisturizing Dog Shampoo: An all natural shampoo is described as salt-free and tear-free. It's scented with rosemary and aloe vera. 5) Woof Woof Natural Doggie Shampoo Bar: This handcrafted soap is vegan and natural, as well as being free of preservatives, fragrances, and dyes. It also contains natural oils to deter fleas and ticks. 6) Kin + Kind Charcoal Deep Cleanse Dog Shampoo: Kin + Kind's shampoo has all natural and organic ingredients. The charcoal removes impurities while essential oils leave your pup smelling delicious. 7) Paws & Pals Natural Shampoo and Conditioner: This shampoo and conditioner contains natural, organic and vegan ingredients that will soothe your dog's skin. 8) Dogtails Dog Shampoo: I love the design here almost as much as I love the natural ingredients and sustainable packaging. What did I miss? 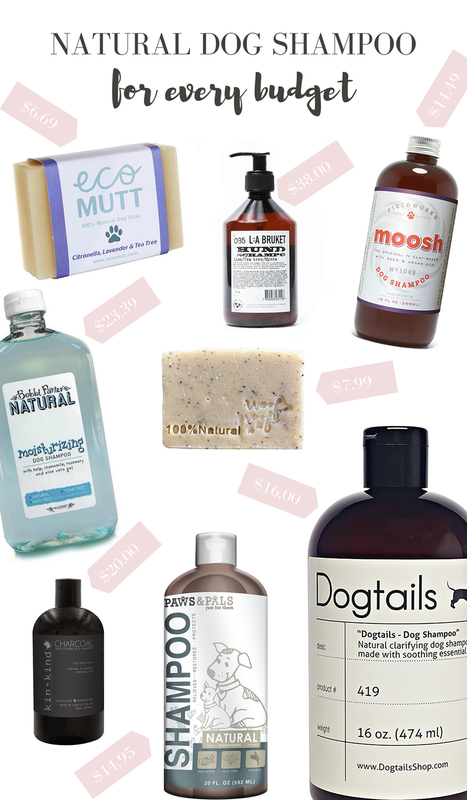 What natural dog products do you and your pup love? Extra credit if they smell amazing!